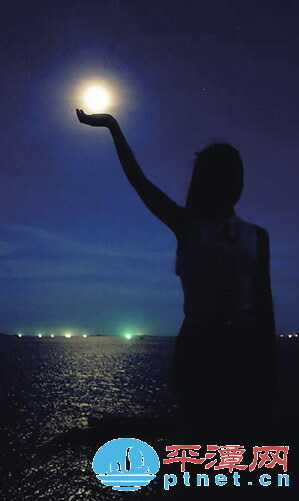 As Mid-Autumn Day approaches, local newspaper Pingtan Times recommends several places to see the full moon. Because that Pingtan is an island county, most of those locations are by the sea and on the mountain top. This is one of the most famous beaches in Pingtan with long shorelines and fine sands. Situated by Huandao Road, the traffic condition is convenient and it is a universal choice for both local residents and tourists. The beach is as busy at night as in daytime. There are a food court and a display of gorgeous sand sculpture works. The park is situated in the south of Zhuyuhu Park in suburban Pingtan. There are 48 creative sculptures by artists from 19 countries and regions, creating a strong atmosphere of humanity. Walking down the lanes in the park and taking a stop on the wooden bridge to admire the moon feels like a wonderland. Zhaiding mountain, situated in the southwest of Aoqian town, is the one of the highest mountains in Pingtan. The mountain has a commanding view of the whole island, which makes it a perfect location to watch the sunrise and full moon. The park is on higher ground in downtown Pingtan. If you go there to watch the moon it will save you a lot of hassles on the way. The park is has a big plaza and Chinese pavilions inside. The best view of the moon is from the highest point of the park, up the stone stairs. Be sure to make your trip early, because the best spots will go quickly. Similar to Longfengtou Beach, the resort boasts a long shoreline and white beaches, and the seawater is even clearer. There are many artificial and natural landscapes at the resort. But since we are talking about moon watching, then it has to be the Banyue (literally “companion of the moon”) Building. The whole building is immersed in moonlight at night and the compelling scene gives the greatest pleasure and satisfaction. Unlike city dellers, who have to find high places to enjoy the moon, the rural people can find a nice spot very easily. Yuyu Village in Liushui township is a traditional village at the foot of Junshan Hill. 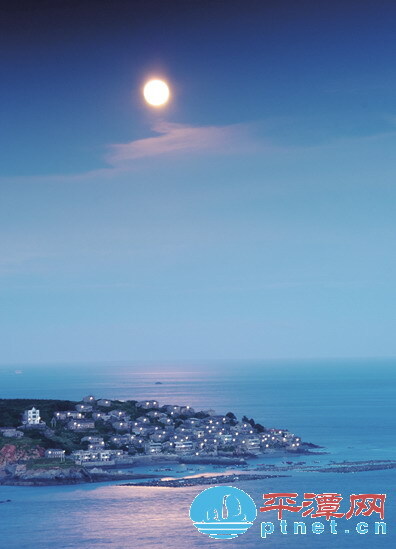 Local residents can scale the hill to get a spectacular view where the glittering stone houses and peaceful crop fields are shrouded in moonlight, with the sea and the night sky mingling far away.